This was the theme song for today. Today at least started on a good note. I stopped by Starbucks and they were handing out frappe samples. Yummy horchata! From there I went to the Museum of Popular Art. They had a fantastic display of ceramics and pottery. 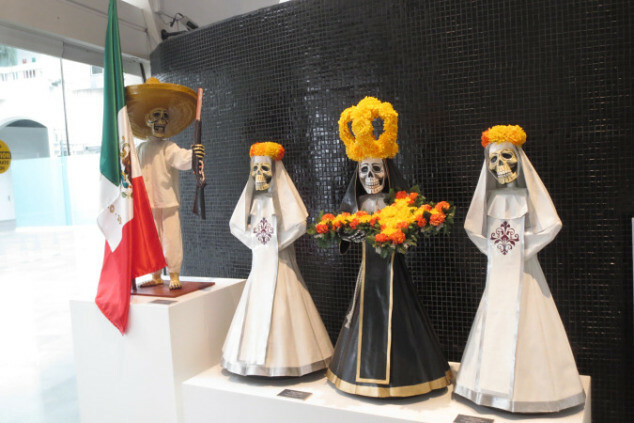 Mexican skull art is very popular and it’s significance dates back all the way to the Aztecs. 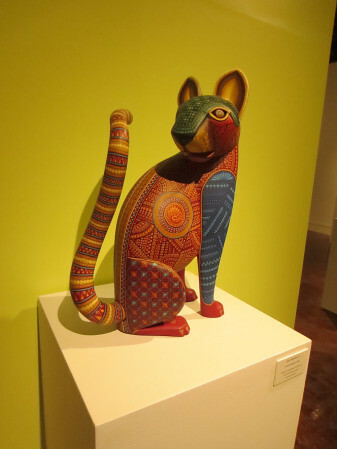 The museum also had an impressive collection of traditional Zapotec wooden sculptures. They were carved by Jacobo Angeles and painted by his wife, Maria using natural dyes. 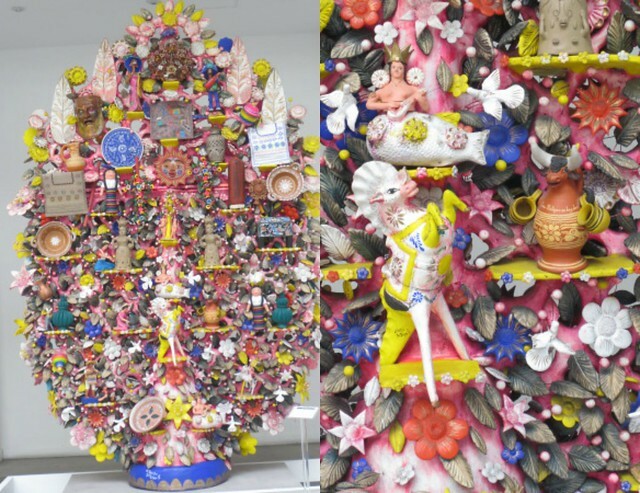 They also had an intricately carved wooden sculpture at the entrance. From there, things got weird. I wandered into this museum called Laboratorio Arte Alameda. It was pitch black. They had small projectors in the rooms with Spanish voices chanting. Hah. I felt like I was involved in the movie The Ring and that seriously creepy girl was going to crawl out of the screen at any time. I left with the heebie-jeebies! Hah. Soo bizarre! From here, I went on a trek to the Polanco neighborhood. 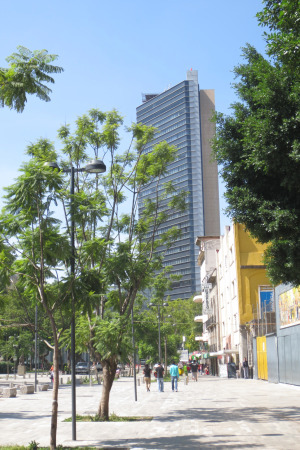 The Polanco neighborhood is full of money. Some of the wealthiest families in Mexico have homes here. 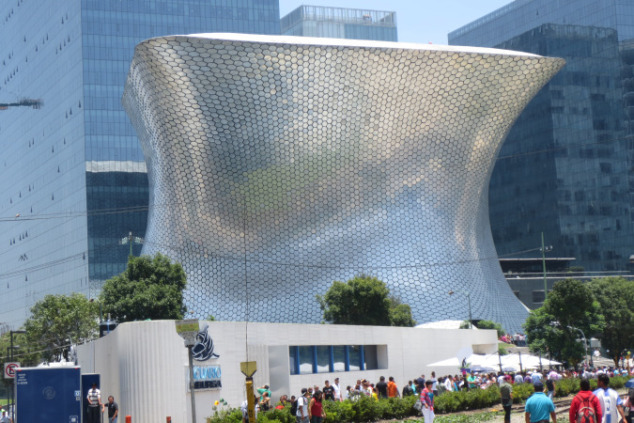 I went there to visit the Museo Soumaya, which holds over 60,000 pieces of art. The majority of pieces are classical European sculptures dating all the way back to the 15th century. The museum is also FREE on Sunday. 🙂 After a strange day with a TON of walking, I needed a snack. I stopped by the store for japones and a juice box. 🙂 People here are CRAZY about japones! They are somewhat of a staple here in Mexico City. Japones are peanuts encased in a crunchy coated shell. The shell is sweet, yet salty with a hint of soy. You can also find them flavored with chile or lime. 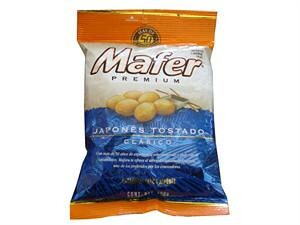 They are strangely addicting and uniquely Mexican. Today was slightly bizarre and very exhausting. I stayed up in 2am last night to finish my last assignment, so I know that tonight I will sleep well. One more week of CELTA. Bring it on! Megan, all that you’ve presented here is exceptionally enjoyable indeed: WOW! for but six weeks or a couple of months. a natural consequence of the core of my being and my years in the academic community. You impress; your parents certainly are exceptionally proud of you, and so am I.
my spanish language immersion, the experiences I enjoy as I shall most certainly elect to live with a family wherever I decide to go (most likely either Panama, Mexico, or Costa Rica, and when I have cultural notes that I might believe to be of interest to such a sharp, involved, effervescent person as you. So, as one hears (and, of course, says) in Costa Rica, “Pura Vida! Anon.